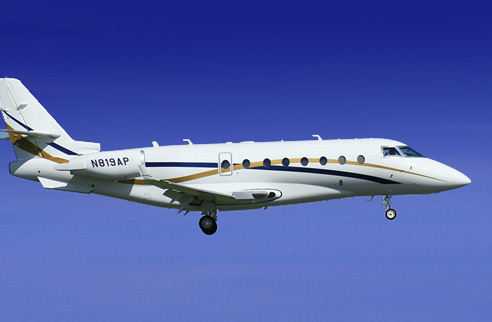 The Gulfstream G200 large-cabin, mid-range business jet can cruise at a maximum altitude of 45,000 feet with a maximum range of 3,400 nautical miles. At Mach 0.80 cruise, the G200 is a true transcontinental performer. The G200 can carry up to 8 passengers with luggage, and fly approximately 3,000 nm . What's more, it can fly over 2,200 nm without refueling after landing at its maximum landing weight. That means fewer stops along the way. For example: When leaving from New York with four passengers, we are able to fly non-stop to London, Caracas, Mexico City, or anywhere else in the Continental US. Any of the Hawaiian Islands are a perfect non-stop destination from anywhere on the west coast. It's been said that life is not a destination, but rather a journey. At AO SKY, we believe both are equally important and it is our goal to surround you in comfort and luxury every mile of the way. Without a doubt, every flight is a spectacular experience in our G200.